Welcome to the 15th episode of the DFB Podcast! In this episode we cover the latest Disney Food News, including exciting WDW FREE DINING news and tips; cover some of the most unique snacks at each Disney park; answer a few listener questions; and reveal the answer to our Episode 14 trivia question and stump you with a new one! For this episode’s main segment, AJ and Brad chat about some of the best and most unique snacks found at each Disneyland and at Walt Disney World park. Listen hard for the difference between Tigger Tails and Tiger Tails, as well as why AJ finds the plastic cheese at Disneyland superior! Angelina, of Vacaville, California: The last time that I was in Disneyland I tried the Hungry Bear Restaurant and was blown away by their Fried Green Tomato sandwich. What are some other unique finds in Disneyland, Downtown Disney, or Disney California Adventure that not everyone knows about? At which two Walt Disney World locations can you find house-made caramel corn? Send your answer to trivia@disneyfoodblog.com to be entered to win a Disney Food Blog Dining Guide e-Book of your choice! 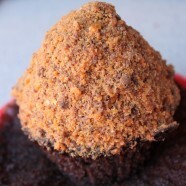 About the Picture: Why, it’s the mother of all cupcakes, a star of the DFB Snack Attack, and an early-on DFB find: The Butterfinger Cupcake, found in Hollywood Studios’ Starring Rolls Cafe! Want More Snacks? Want to know more about the array of snacks available at Disney Parks? Then the Magic Kingdom, Epcot, and upcoming Animal Kingdom and Hollywood Studios mini guides to everything snacks are the answer! Get yours today! Or, opt to get our specially-priced bundle of both the Magic Kingdom and Epcot snack guides, along with the 2013 DFB Guide to WDW Dining! Thanks for answering my question!!! Looking forward to my next trip to DL in October!!! Just wanted to let you know that of all the Disney Podcasts I listen to, yours is my favourite. I love the laid back, fun and friendly vibe between the two of you. And I like that you sound genuine in your opinions or enthusiasm. So hurry up and make a July episode as I’ve burned through all your recordings! 😉 Looking forward to the next one, and thanks for the previous ones. Love the podcasts. But may I please make a correction to your pronunciation of the new restaurant Monsieur Paul. The French word “monsieur” is not pronounced “mon-sewer” with a short pronunciation of the letter “o” in “mon”. It’s pronounced phonetically more like “mes-ieur or phonetically məs-ˈyə(r). I know this is being picky, but it drives anybody who took high school French a little bonkers. It’s like when people say the French word “voila” as “wallah” instead of vwä-ˈlä. Again, I know I’m being picky here and I really DO enjoy your podcast. Just had to air a pet peeve. Thanks for putting up with my nonsense.